This beautiful brand new 4 air-condition bedrooms holiday rental is one of the latest addition in our selected designer Villas in Umalas. Featuring thoughtful amenities to ensure an unparalleled sense of comfort, the cozy Villa M4 has an ideal location in one of Bali’s upscale community. 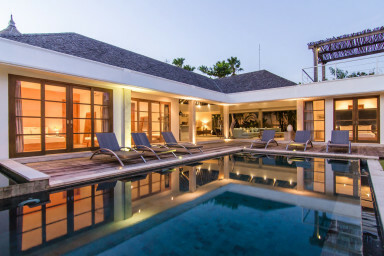 Spacious living area and a rooftop cabana can be found in the main building has made the Villa a perfect sanctuary for guests with large family or groups travelling together. We enjoyed a wonderful time at the magnificent villa. Even though the water was not running on our arrival day, the problem was fixed within a few hours and we didn't have any other problems at all. We especially liked the great and friendly staff, Ray was a wonderful "house mother" and organised everything we asked for exceptionally well! Thank you very much, we would recommend your place anytime.